It is time for the biannual Sew, Mama, Sew Giveaway Day! I'll be giving away the 8 most recent editions to my pattern line! To enter, leave me a comment on this post telling me what your favorite of my patterns is. (Thumbnails are listed on the sidebar on the left.) International entires are welcome. If you aren't a follower I'd love for you to become one, but it isn't required. Please make sure to leave me a way to contact you should you win. The deadline for entry is May 25 at 5 p.m. PST. Gorgeous patterns. Bejeweled is my favorite. It's really hard to choose. I guess it's a toss-up between beribboned, bedazzled, and beflowered. I like Cafe Mocha! Very cool! Definitely garden jewels! But they all are beautiful! Thanks for the chance! I love the Beflowered pattern! Blossoms (which I already own) and Garden Jewels are my faves. I love Caramel and Cocoa...simple and lovely! Garden Path is my favourite! Yikes - so many great choices! I keep going back to Caramel and Cocoa so I think that's the one! I like garden paths. Thanks! Hard to choose; Garden Paths is tops with Garden Jewels a close second. Thanks for the chance at your giveaway. Okay, you have a lot of really beautiful patterns, so it's hard to pick one, but I think my favorite is Bubbles. Thank you for having a giveaway! I really like Garden Jewels. Beflowered an Garden jewels are amazing! Thanks! Your patterns are beautiful. I love Garden Jewels. Thanks for sharing in the Giveaway Day. 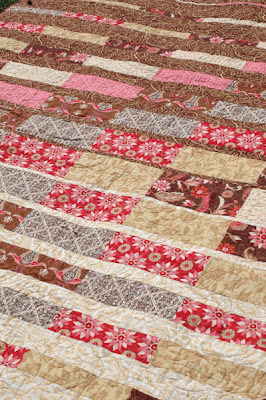 I love the beribboned quilt very striking! I really Caramel and Cocoa. I think that Beflowered and Garden Jewels are quite bright and pretty. Thank you for the opportunity to win your pretty patterns. I'm loving Garden Jewels - looks like it would be fun to make! I really like Cafe Mocha! I'm a follower and my favorite pattern is Garden Path. Thanks! I have always loved Caramel and Cocoa! Thanks for the chance to win! It really is hard to choose one of your patterns as my favorite. It really depends on what I need since you have some of your patterns that are perfect for the larger printed fabrics. Today however, my favorite would have to be Garden Jewels. 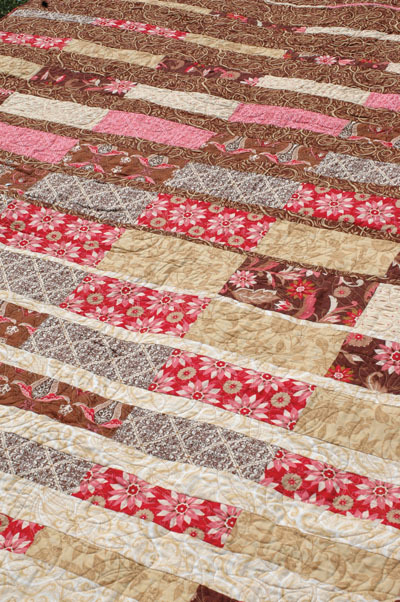 That is just such a pretty quilt pattern. Caramel and Cocoa is great! I love all your patterns, however my favorite is "Garden Jewels". Chance to win would be fantastic. All the patterns are lovely, but I especially like "Bedazzled". Thanks for the chance at this super generous giveaway! I like the Garden Jewels! love all your patterns but my fave is Bejeweled! What beautiful patterns! It's hard to narrow them down, but I think that my favorites are Garden Jewels and Bubbles. Thanks so much for the chance at your giveaway! I love Beribboned! Thanks for a very generous giveaway. They are all wonderful, but if I had to pick just one.... I would pick "Bejeweled". thanks! I love them all, but really like Bejeweled. Thanks for the giveaway ! Bubbles!!! 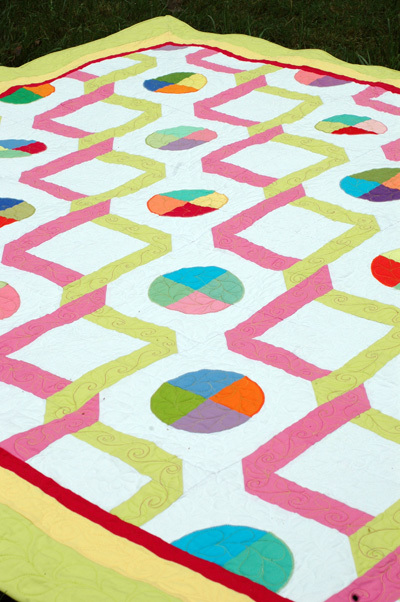 I've been wanting to do a dotty/bubble quilt for a while, but the one in my Kaffe Fassett book is much too big. bejuled looks like a quilt my wife liked at the HMQS show we went too. I love Garden Jewels the best, but they are all lovely. Thanks for the giveaway! An eight quilt pattern giveaway - fabulous!! My favorite is Bubbles - I'm a polka dot gal. Many thanks! Love all of them but the one I would probably sew first would have to be Cafe Mocha!! Ooh! I love bejewelled! Thanks! Picking one favorite from all your beautiful designs is nigh on to impossible; I'm choosing Portraits of My Garden, but oh it was hard! Garden Path is my fave! bejeweled. I love all of yours. They are super cute. I like the Garden Jewels. Beflowered is my favorite. 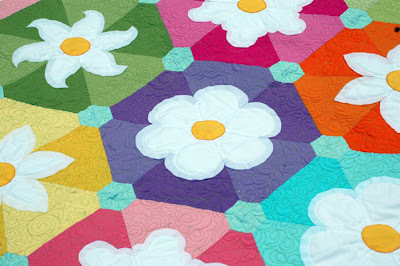 I'm totally into hexagons and like the way you incorporated them. 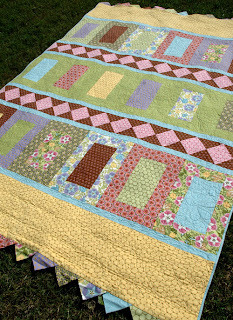 I love the cafe Mocha pattern Amanda- Thanks for participating in the blog hop. You have created some lovely new patterns- They all are pretty! Your patterns are very unique. I love the Blossoms pattern. 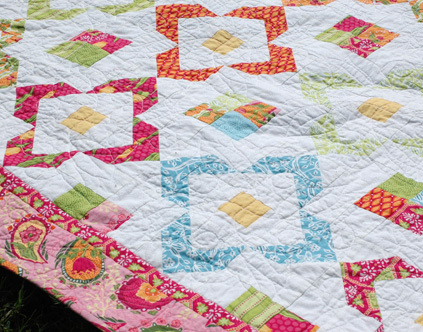 I'm in love with your beribboned quilt! Gorgeous patterns! Thanks for the chance to win! My favorite is Garden Jewels: It caught my eye from the start and I still love it!! I love them all but my favorite is Bejeweled!! Beautiful patterns! My favorite is Blossoms. Thanks for the chance to win! My favourite is Garden Jewels. All of your patterns are amazing. Thanks for the giveaway. I like the garden jewels and would like to see it with darker colors. It is really hard to choose but the one that is the winner for me is "BEJEWELED". They are all so beautiful but I love Portraits of my Garden. Garden Jewels, without a doubt! But all of your patterns are beautiful! I like bejewelled and garden jewel. Ummm...how do I pick just one! As I was scrolling through the post I was like,"Oh I like that one, oh and that one, oh...."
My favorite is Garden Jewels--though really I love them all! I really like that bubbles tablerunner on the right side also! You exude talent: my favorite is Garden Path,but hard to choose just one! I think you have done a wonderful job on these new patterns. It is very difficult to decide but....if I had to pick, I think, Garden Paths is my favorite. It is an excellent way to use the florals in my stash. I don't think I could possibly choose one so the top two are Garden Jewels and Village Green. Thanks! I love all of your patterns but if I have to choose it would be Caramel and Cocoa. I am a follower and thanks for the giveaway . My favorite is portraits of my garden. I think I like beribboned the best. Bejeweled is awesome, but looks complicated! Great patterns! • • • I like Bejeweled. love the garden jewels pattern! Great giveaway! Caffee Mocha is my favorite! I really like Bejeweled. There are some really nice patterns. I think Bejeweled looks fun and different! Bejweled is my most favoite. It reminds me of the game and would be great to make. I love Beflowered, I made it for my grand-daughters first big girl bed, and loved it. I plan on using garden pathways to make a quilt for my son that is getting married. Beflowered is awesome! So bold! I like bejeweled the best! Thanks for the giveaway! Garden Jewels is my favourite. Hi Amanda. I really liked Garden Jewels. Thanks for the giveaway. Love Garden Paths, always loved garden paths. Thanks. I still love Garden Paths the most. Thank you for the chance to win your patterns! My favorite is Bedazzled! It's hard to choose though! I like the playfulness of Garden Jewels. Thanks for the chance to win! I think my favorite is "Bedazzled." Very pretty patterns, all of them! I think I like Garden Jewels best. I own Garden Paths already. 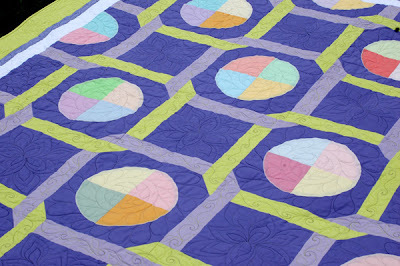 My next favorite quilt is Bejeweled. Thanks for the giveaway. Cafe Mocha. At a glance, it looks like it would be really hard to piece but I bet you have a clever basic block that makes it a breeze. thanks for the chance! Town square? They're all pretty neat! Thanks for the giveaway! I love Beribboned! It's so active just to look at it. I really like "Garden Jewels" It looks like it is alot of fun. beflowered - butI would like it more with a straight edge, but then I'm sure Icould make that. Thanks for the chance! I really like the Blossoms pattern. So nice! I LOVE Bejeweled. So pretty. Garden Jewels is my favourite - THANKS for the chance! I love all your patterns but Village Green is a favorite. I'm a follower and love to read your blog. I really like Garden Jewels. Thank you for a great giveaway. That Caramel and Cocoa is gorgeous! I love the shading. I like Towne Square the best but it might be because I love the fabrics. It looks good. I love the Cafe Mocha pattern. Thanks for the chance to win. I vote for Bejeweled. I might 'need' this one, if I don't win! I'm a Garden Jewels kind of girl. It's absolutely beautiful. I think my favorite is beribboned. I like the way the fabrics intertwine. Lovely. Thanks for the chance. Garden Jewels is my favorite! Garden Jewel - absolutely love it. Really beautiful patterns. I have to say Beribboned is my favorite and I'm now happily a follower! Thanks! Garden Paths! I love it! I am follower and proud of it! Thanks for the great giveaway. such a generous giveaway. my fav. pattern is Garden Jewels. Great patterns! I love Bejewelled. They are all beautiful! Cafe Mocha. How do you choose just one! Bejeweled and Garden Jewels are my favorite for the summer! I love Bejeweled. I've always loved yo-yo's and that is a super cute way to use them. Thanks for the giveaway! Hard to choose, but I do love Garden Jewels and Garden path. I already follow your blog. Thanks. I love the garden Jewels! I love your Bubbles pattern. by beflowered is also lovely! It a toss up of Bedazzled, Beribboned & Garden Jewel for me. Thanks for the giveaway. I love Garden Jewels! Thank you for the opportunity to win these, they are all fabulous! Beautiful patterns! I think Village Green was my favorite but really, it was hard to choose. Garden Jewels :) Thanks Amanda! bejeweled. they are all gorgeous!! A relatively new quilter here, and just found your blog & fabrics. Uh oh, I'm in trouble! :) LOVE Cafe Mocha!! Gorgeous! Cafe Mocha is my favorite. Thanks for the giveaway! Thanks for a great giveaway. I would love to make your Bejeweled quilt. 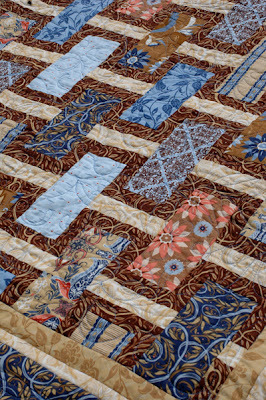 My favorite is portraits of my garden - I just love the garden quilts!!!!!! 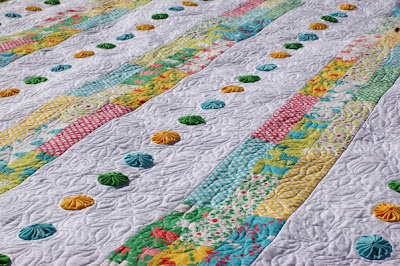 Thank you for offering your wonderful quilt patterns in this giveaway!!!! Hmmm, tough to chose a favorite but I'd have to go with Caramel & Cocoa. Thanks for the chance to win & the incredible inspiration on your blog. Garden jewel is simply awesome. I think I will buy it if I don't win it ! My favorite is Bejewelled. Thanks for the opportunity to win! I love the bejeweled, but it's really hard to only pick one! I love all your patterns! If I have to choose I'll say Garden Jewels. Thank you for a super generous giveaway and a chance to win. I'm also a follower. Hard to choose. Garden Paths would have to be my fave.